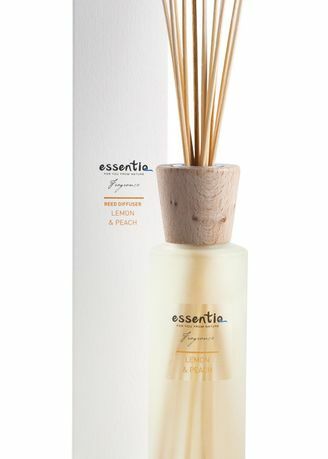 The fragrance starts by taking you to the Mediterranean amongst the freshness of citrus trees of bergamot orange and lemon and the sweetness of ripe peach. The smell then takes you to the lavender and rosemary fields of Provence. If you close your eyes, you finally slip into the depths of the cedar wood. Highly concentrated room scent, 200 ml. Content of the product is sufficient for more than three months of scent in your room. Relieve stress and anxiety. Directions for UseReplace the cork seal of the bottle with the wooden cap provided and put several rattan sticks into the fragrance. If you wish to intensify the smell, turn the sticks over. The product consists of 100% bio alcohol, essential oils of lemon, peach, bergamot orange, lavender, rosemary and cedar wood. Only natural colours are used. All fragrances are certified by the International Fragrance Association and are not toxic for humans (IFRA). Glass packaging can be recycled. Sticks are made of natural and unbleached rattan and wooden cups are from certified sustainable forests. Made in Slovenia, EU. PRECAUTIONS   - R11 Highly flammable.- R43 May cause sensitization by skin contact.- R52/53 Harmful to aquatic organisms, may cause long-term adverse effects in the aquatic environment.- S2 Keep out of the reach of children.- S9 Keep container in a well-ventilated place.- S16 Keep away from sources of ignition “ No smoking.- S24 Avoid contact with skin.- S37 Wear suitable gloves.- S46 If swallowed, seek medical advice immediately and show this container or label.